I decided to do this race as it was the inaugural race. It was also organised by John Lunt (ex Human Race Director & organiser of London 2012 Triathlon races) so it should be a good race. We drove up on the Saturday, leaving behind a very wet & dreary Verwood, & tried to beat the rain that was coming in fast from the west. We managed to stay ahead of it & get registered, racked (I wasn’t happy with leaving my pride & joy overnight in the pouring rain & gale force winds & never knowing what you would find on race day. We also looked around the very impressive expo & get back to the hotel to check ourselves in before the rain settled in the night. I also managed to get a quick cheeky 15min run before the rain came as well. We didn’t have to get up a stupid o’clock as my wave was in at 8:35 so I got to transition on a very warm, bright sunny morning, & found that my pride & joy had survived the torrent we had overnight. I had plenty of time to check out the ins & out as well as for my usual pre-race warm up jog. We entered the sea after hobbling over the Brighton pebbled beach like demented penguins. The temperature of the water was OK. We started on the shore for a swim out to the first buoy which was the start of a rectangular swim course which we had to do twice (I did say to Coach 2 that it seems a long way out!!!). The swim wasn’t too bad, but the only issue was the buoys he had on the course were all lying lengthwise & not standing upright so a lot of extra sighting was called for to stay on track. Otherwise, the swim was very good. I entered T1 via the very stony beach to be told by Coach 2 that I was 7th out of my wave. I then headed out onto the bike course which was an 8 lap, fairly flat, out & back course along the Kingsway. There were no untoward problems with the bike leg & I had plenty of people to keep overtaking, but equally I didn’t know who was in my wave, so I just continued overtaking. Using the turnaround point at each end to get a drink on board. I did wonder though were Coach 2 was at the beginning of the bike course, but I found out after the race that she was thoroughly enjoying herself in & around the Expo doing Zumba & Yoga!!! But she did manage to haul herself away to see me on my last 3 laps. Into T2 where I had a another very good transition & headed off onto the 4 lap run along the promenade. 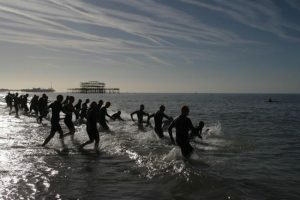 The only issue I had with this was that the Brightonians had all come out en-masse on this now very bright warm sunny day & decided to walk along the course & not worry about the 800 odd runners that were running along the promenade. The first lap seemed to go OK. There was one person who I really wanted to beat on the run & I knew that he was a vastly better runner than I was so I was running scared & worried as I hadn’t spotted him on the bike as I was going so fast (ha, ha). Lap 2 – some guy came out in front of me & I managed to stick with him for most of the second lap but managed to drop him on the 3rd lap because the guy who I didn’t want to beat me was now starting to close in. 4th lap – I felt like I was struggling a little bit on the final run home, but he didn’t catch me so I was well chuffed.